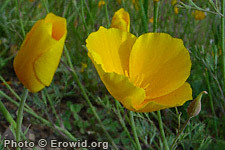 Eschscholzia californica is a perennial herb growing approx 30 cm tall. Leaves are greyish green and finely divided. Four petalled flowers range from white to red, though most commonly orange and yellow. It is the state flower of California. Does not contain opium.